My Samsung phone also supports screen mirroring, so I can display its screen live on the new TV as well. For fixed setting projection needs, I don’t see why anyone should ever again shell out US$700 or $800 for a projector – that was the price last time my company bought one six years ago – when one can spend the same amount and get a 50″ TV with 3840 x 2160 resolution, triple that of a typical projector, or spend a hundred or two more for a 60″ version. The quality is several tons better than projecting on a white screen, the speed is fine on 802.11n wireless, and you don’t even have to turn the lights off. wow! That is certainly impressive! I’ll be looking into getting one of these for mom! 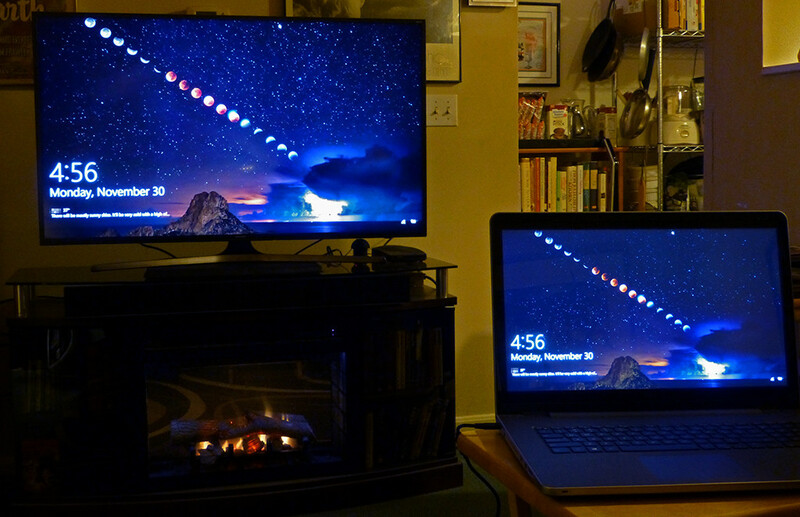 FYI, I just tried a couple minutes of full-screen video on the laptop while WiFi mirroring to the TV, both screens active, and saw no hiccups or glitches, which I certainly thought I might see, so it is some kind of amazing. Just like regular projector settings, you can specify which of the screens you want active, so you can have the laptop/desktop screen off while mirroring on the TV if you like.